“You’re so passionate about Project Management, you should write a blog about it,” one of my colleagues said a couple of years back. I wrote one blog and then, having found it quite enjoyable, I wrote a second and then a third. I got some nice feedback, got shared, had a client mention that they’d read and enjoyed it and by this time I was hooked. Now colleagues say that I am as passionate about my blogs as I am Project Management. In fact, that same colleague just joked that I should now write a blog … about writing a blog. And that’s how we come to be here! 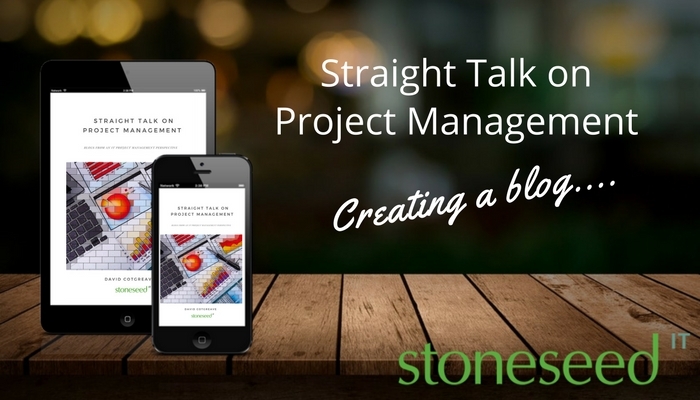 Actually, the disciplines and skills used for Project Management are the same ones that I use when writing my blogs. Blogs which are published by the likes of CIO.com shared and republished around the world and now turned into this amazing ebook. So really, when I research, plan and write a blog I’m really just exercising some of my Project Management muscles, at least that’s what I tell my colleagues. IT Project Managers are were born to be natural bloggers! End User Focus – Who is it aimed at? In IT Projects you focus on stakeholders and end users, what deliverables will be accessed, by who and how. If I am writing a blog aimed at CIOs I try to imagine that I am writing directly to one of my CIO friends, sometimes going as far as having their LinkedIn profile open so that I can tab across to see their photo to and imagine what I think they’d make of the words I have written. This knowledge of who you’re aiming your IT Project or blog at helps you stay true to your target audience. Central to any blog or any IT Project is “the point”. In the case of a blog, it’s the main message that I want the reader to take away, in an IT Project it’s the specific business outcomes. Scope is key for both, wandering off message in an IT Project can bust budgets and delay delivery, doing the same in a blog post might have your eyes wandering. In the same way that I ensure that I have fully scoped a project before starting, I always have a blog skeleton in place before I get too deep into the creative writing part. Creating a completely detailed project scope or mapping out the beginning middle and end of a blog is a necessity not a luxury. As well as typing the “one line point” at the top of the page, I hand write it onto a small Post-it note that I stick to the corner of my screen and in a notepad that I use for jotting down thoughts. This act of physically writing the message by hand commits it to my mind and leaves me in no doubt what I am writing about. An IT Project has to catch the imagination of those you are pitching it to, similarly, I have been working lately on eye-catching headlines for blogs. Often summing up a bundle of thoughts into a short sentence takes longer than writing the blog itself – but it is rewarded with a higher readership. I have seen many perfectly rational and business case evidenced IT Projects fail to get a green light because of the way that they have been presented and proposed. Writing a blog is more of a hobby but I treat each one with the approach I would an IT Project! You keep team members motivated by rewarding them when milestones are reached, likewise, I make sure that I have treats to encourage me to write a blog. Obviously, blog writing isn’t my top priority but I do find it a very cathartic exercise, I get really nice feedback and of course, it is a great marketing vehicle. I set milestones when writing blogs to make sure they stay on track, in much the same way that I would a project and I make sure that I celebrate, with a little glass of something, to keep me motivated. Managing Time Well – Prioritise! Over time the blogs started to get published in some exciting places and attract interest from industry publications. Many of these had deadlines and publishing agendas and when you throw “the regular workload” into the mix it quickly became clear that I would have to apply PM time management disciplines to blog writing. Prioritising subjects around these deadlines has helped keep the whole process fun meanwhile prioritising with regards to topicality and lifespan of issues has hopefully given them a sense of the day and kept the blogs fresh. In the same way that the ability to accept praise and receive criticism and use it positively is important for project managers, I have found it useful to adopt this approach to writing the blogs. Sometimes a kernel of an idea for a post can be found in feedback from a CIO or Project Manager, in fact, a handful of blogs are thanks entirely to this type of communication. I love receiving nice reviews for my blogs but the (very) occasional message disagreeing with the point I am making is a chance to see things from a different perspective – and take this back into my day to day work – making me better! Before you read this, my fabulous colleagues Helen and Olivia will have gone through it with a fine toothcomb checking for any typos! It is they who will suggest the publication that best fits my narrative. I casually share thoughts, ideas and topics with fellow directors, clients and friends and listen to what they say. Cohesive teams are vital to the success of IT Projects and although it’s my name above the door, I am grateful for the input of all of those who contribute to my blogs – even if they don’t know that’s what they are doing! Finally, and by way of conclusion, it’s important to enjoy doing this. IT Projects aren’t always easy but it’s crucial that you still enjoy sorting out the problems and challenges with which you are faced otherwise what’s the point? It is exactly the same with a blog post. I really enjoy writing about what I still consider to be the best job in the world. I hope that you enjoy reading them – be sure to let me know!